Ed has 20+ years experience in Real Estate, land development, custom home building & interior design. 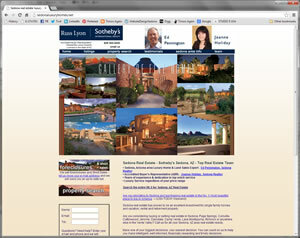 He has been a Top Producer in Sedona for the last 10 years and is a musician, pilot & bike, car and boat enthusiast. Ed has a strong national & international presence on the Internet with over 35 million dollars in listings of the finest properties & recent sales of homes & vacant land. Ed Pennington graduated from a Military High School and then attended the University of Arizona where he received his BS degree. He got his first taste of the Real Estate business with his partner Dave Fraker in Tucson. Ed and Dave were successful builders & helped develop a 356 acre parcel of land. Ed spent almost 10 years developing & building in that project where he still returns today to his friends that he sold beautiful lots to in "Finisterra". When that project was completed, and wanting to be closer to his mother who was in failing health, Ed moved back East where he purchased a Chevrolet dealership and soon added Mitisubishi to the mix. After successfully turning the dealership around he became partners with a local Cadillac Oldsmobile dealer & put Chevrolet, Cadillac and Oldsmobile under one roof. You can count on Ed & his team to help you make intelligent, well informed, financially rewarding & timely decisions. He is committed to finding the right property for you or selling your property at the right price.